So real life has once again taken hold and my internet self has been bound, gagged and locked in the basement. In other words I’ve been back in full-time work, although currently it is only a temporary position. That has ment that game making and updating the blog has been put on the back burner for now while I’m getting back into the swing of early morning get-ups and getting in late, of course when my body is honed to this I’ll be busy beavering away on Construct once again. My computer died on me 😦 Not a complete, buy a new computer died, but the type that means losing lots of files that I never got round to backing up, type of died. So you can probably guess that most of my graphics for my Construct projects and also most of my cap files have gone for a burton. It looks like Conway and some of the other projects may never see the light of day without a completely new set of graphics and a complete re-write in Construct. I’ve uploaded a video to YouTube showing the progress I made on Conway as described in the post below. It shows the two versions I have working. 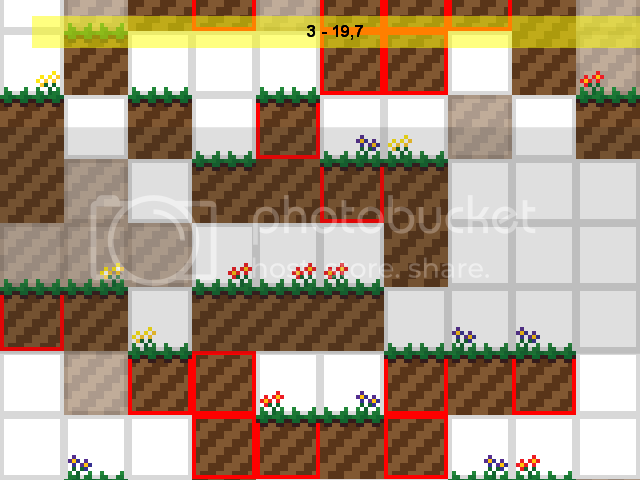 The simple block level and the “Bitwise” number tiled level. Since embedding doesn’t seem to work for me you’ll have to click HERE. 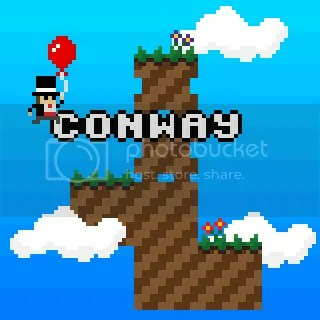 OK so thats the clever bit of Conway I have worked on, but I’ve also played around with the gameplay too. I have designed a quick and easy game mode around a well-known “Game Of Life” pattern called a “Gosper Gun” it is a pattern that basically bounces back and forth between to static blocks whilst firing out “gliders”. That also means that I have the “Cellular Automata” level and the actual platforming working together perfectly. It took a while but I managed to copy over the events from one to the other, although I did have to get rid of an annoying crash that I couldn’t pin down. It took an hour of looking and an hours break, but I finally tracked it down to a “OR” that seems to be rather buggy at the moment in Construct. Still it’s working now and thats the main thing. Just got to polish up the “Gosper Gun” mode a little and I may post the demo for people to have a play around with and hopefully get some feedback to help push the game along. So the feature in the gaming magazine Joystick has motivated me to pull my finger out and work on something again. I’ve decided to go back to an old project, to flesh it out further and hopefully make something nice, interesting and fun to play. The game in question is The Evolutionary Adventures Of C.A Conway which I’ve now renamed to just Conway. It uses John Conway’s Game Of Life to generate a living/dying platform level. I’m going to change the gameplay a little from that in the video, although on the whole it will still consist of collecting top hats. I’ve overhauled the graphics quite a bit, well to the best of my artistic ability and at least to my mind looks a lot prettier. I posted the prototype shown in the video at TIGSource to get a few ideas about how to expand the game further, and although there have been only a few replies so far, they were at least helpful and encouraging to someone still new to game creation. In the coming days I’ll post a little bit of progress on the gameplay and the “Cellular Automata” level which at the moment are completely separate of each other. And hopefully I can keep focused on this project and keep up the development and the DevLog. 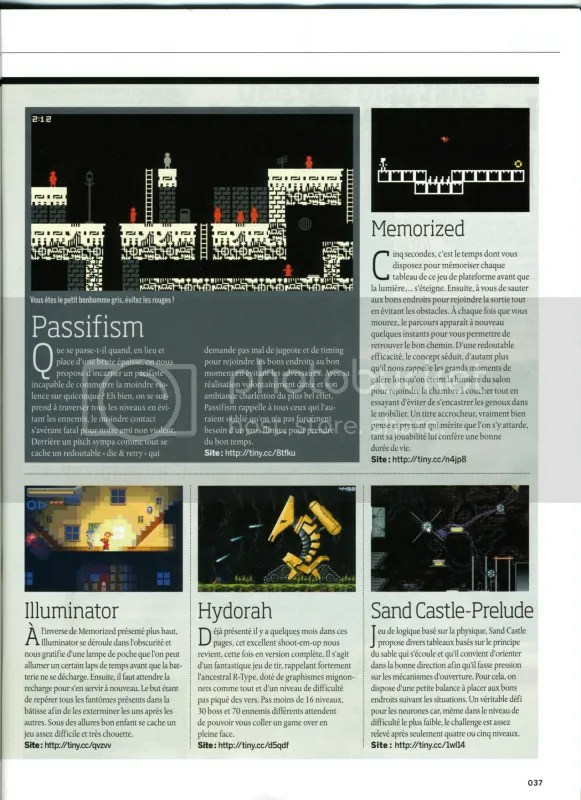 I was recently approached to allow Memorized to be distributed on the cover DVD of the French gaming magazine Joystick. Of course I jumped at the chance. I’ve been waiting for the issue to be released before posting anything, but I received my copy today (September Issue) and thought I’d share it with the world. Not the whole magazine. Just the Memorized article. Well that has boosted my morale 🙂 Maybe now I can find the enthusiasm and drive to work on Bit Hero or one of the countless other partially finished games, engines and prototypes I have festering away in the darkest reaches of my Hard Drive. Oh been a while since I posted here so I’ll let you know why. Basically the World Cup. I love my football (not soccer we play football with our feet, hence football 🙂 ) and with 2 or 3 games per day there wasn’t much time to work with Bit & Droid. I know what you’re going to say though “The World Cup finished ages ago”. Yeah you’re right but I started a small side project that has become bigger than I planned, I haven’t posted about it or posted videos because I wanted to wait until it was nearly complete before showing the game. It isn’t anything special or something innovative, it’s just a small Thrust type collect ’em up, that is hopefully going to be fun and challenging. And just because there was no front page news doesn’t mean I’ve not been busy on the blog. Far from it. I’ve added a new section for my .cap files that I have created for fellow Constructors. Feel free to poke around, download any that interest you and hopefully learn Construct. You’ll find the link up in the top right corner. Keep an eye on the .cap section because I probably wont be posting when it’s updated I’ll just add them sneakily :). Till next time when I will hopefully have some news about Bit & Droid. So I had a little idea the other day and decided to prototype it in Construct. The result came out pretty well so I added a nice little GUI and named the program BB@RT. “What Does BB@RT do?” I hear you ask. 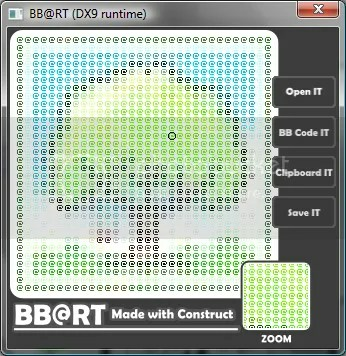 Well BB@RT takes a 32×32 pixel image and turns it into forum compatible BBCODE, you know the markup language that adds bold, italics etc to your forum posts. 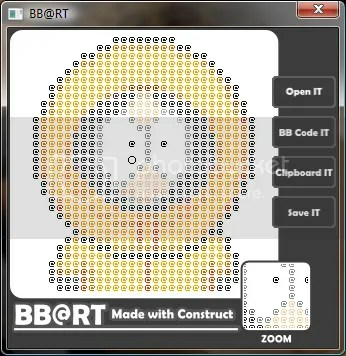 If you paste the outputted BBCODE into any forum post you’ll get a nice full coloured ascii image. Unfortunately WordPress doesn’t use BBCODE so if you go to the forum post for BB@RT you can see what the above images would look like when outputted to BBCODE. The program is really simple to use but there is a Read Me file included in the download., the link for which is in the forum post and just below.